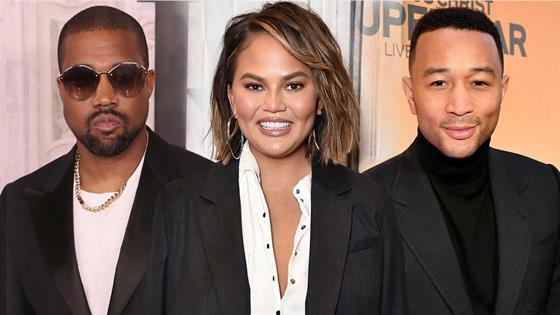 Chrissy Teigen says John Legend and Kanye West "learned a lot" in the months following their public political debate. Back in April, the "Stronger" rapper took to Twitter to share private text messages from the "All of Me" singer about his political views. These messages came shortly after West voiced his support for President Donald Trump, and led to more exchanges between the two artists about history and American politics. "The thing with Kanye is that his opinions have always been super strong," Teigen says is Vogue's November issue, which she's featured in alongside kids Luna and Miles. "He's never been the guy to push them on you, but he will say what he wants to say. Same with John. That's why I loved that they were able to have this civil discourse. Kanye learned a lot in the months after that. John did, too." "You can't just believe you're the right one all the time. That's what makes us horrible," Teigen tells the magazine. "Trust me: My views are super liberal, and I'm like, How could anyone not think this way? But people are also entitled to their opinion." Teigen also opens up to Vogue about being blocked by Trump on Twitter and how it can create anxiety not knowing what the president is sending out on social media. And when social media is in a frenzy over something Trump tweeted, she wonders, "Do I get in the bunker or not?" "I still don't know why I'm not blocked," Legend says to Vogue. "I have said as many bad things about him as she has. Maybe it's because I'm a man; I have no idea." "A lot of people are really smart about staying out of it," Teigen says, talking about avoiding critical comments online. "I'll send something to Kim—a screen grab of the Daily Mail, like some ridiculous headline, and she'll be like, 'Is that what's happening?' And I'm like, 'Kim, this is the biggest story of the week right now!' Then I'll feel bad because she's probably been saving her sanity by not reading this stuff, and meanwhile, I'm like 'Look at this!'" "Much stronger people are like 'I don't care what you think,'" Teigen tells Vogue. "I genuinely do care. I think it's funny when people are like, 'I love how you just don't give a f--k.' I'm like, 'Oh my God. I give so many f--ks.' I want to be liked."